SHERIDAN—The idea of a new Ruby Valley Medical Center has been in the works since 2008, and this weekend the realization of that idea opened its doors to the residents of the Ruby Valley and the patients it will serve. BIG SKY – On Friday, August 17, the opening night of the Moonlight Music Festival, The Mission Temple Fireworks Revival with Paul Thorn & Blind Boys of Alabama had a crowd of hundreds eating out of their hands. ENNIS—A fire camp big enough to be another Madison Valley town sprang up in Ennis last week as an incident management team from southern California arrived to begin work on the Monument and Wigwam fires. ENNIS – The Bureau of Land Management’s Dillon Field Office has issued a fire prevention order temporarily closing the Axolotl Wilderness Study Area in Madison County due to the Monument and Wigwam fires. ENNIS—The Madison Conservation District welcomed Emily Osborn to its team earlier this summer. Osborn takes over the administrator position for the MCD from Cori Koenig. ENNIS—The testing of some wells has already begun on the West Bench, but the Ground Water Investigation Program (GWIP) is still looking to expand the number of test sites for its data collection, set to continue until December of 2019. ENNIS—The Monument Fire southwest of Cameron, first detected on August 6, continued to grow over the weekend and measured 4,215 acres as of Monday morning. A second fire, the Wigwam Fire, was first detected on August 11 and has grown to almost 2,000 acres. Both fires are currently zero percent contained. 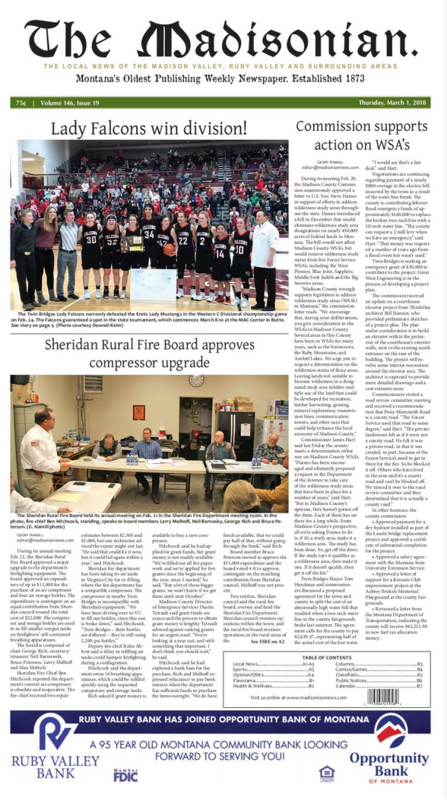 SHERIDAN - Sheridan celebrated its Summer Festival Friday, Aug. 3, through Sunday, Aug. 5, hosted by the Sheridan Volunteer Fire Department. Friday’s festivities included dinner in the park, a beer garden, a kickball tournament and music from Kneejurk. VIRGINIA CITY—After six decades without it, Virginia City is finally getting some gas. At its monthly meeting on Thursday, August 2, the Virginia City town council voted to approve a project that has been on the minds of residents for years—the installation of a functioning gas station.